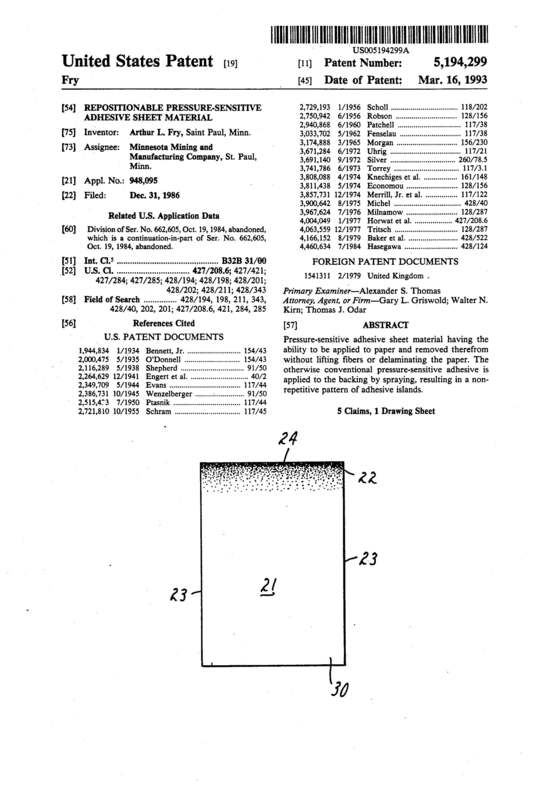 On March 16, 1993, Arthur Fry was granted the patent for REPOSITIONAL PRESSURE-SENSITIVE ADHESIVE SHEET MATERIAL, U.S. Patent No. 5,194,299. Dr. Spencer Silver worked as a scientist for 3M. 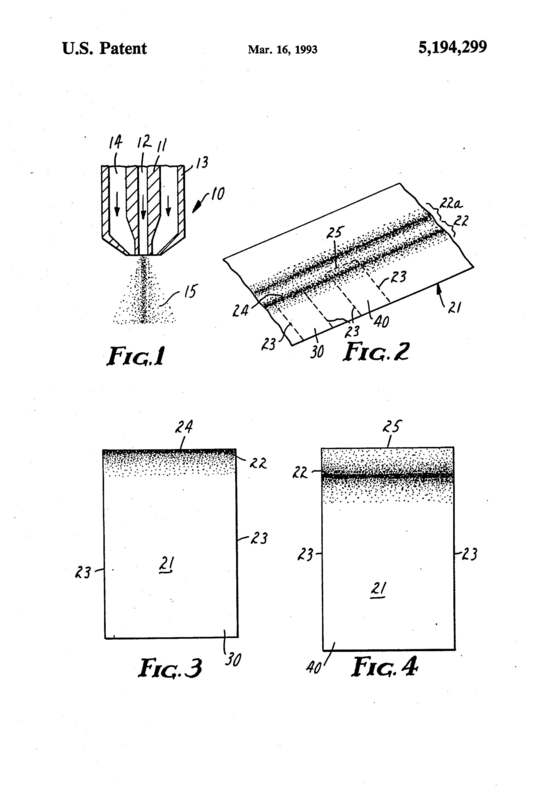 Silver originally sought to develop a better, stronger adhesive. “It was part of my job as a researcher to develop new adhesives, and at that time we wanted to develop bigger, stronger, tougher adhesives,” unfortunately, he had difficulty developing exactly what 3M wanted. In the process of trying to develop a stronger adhesive for 3M Silver accidentally created a new adhesive. This new adhesive used microspheres which were sticky enough to stick to objects over and over, but not sticky enough to damage the surface. Microspheres are defined as “a microscopic hollow sphere, especially of a protein or synthetic polymer.” These spheres look like the bumps on a basketball under a microscope which helps them stick, unstick, and stick again. Arthur Fry, a chemical engineer at 3M, and singer in his church’s choir, constantly tried to mark the pages of his hymn book but needed something, besides tape, he could stick to paper without damaging the pages. He attended a seminar Silver hosted and remembered Silver had exactly what he was dreaming of. Fry came to Silver with an idea for the note and a partnership began. The two began to use Post-its around the office and in their personal lives; they soon realized the huge potential that it had. The iconic yellow color was also a matter of happenstance. The iconic canary yellow was used because at that time it was the only color of scrap paper the lab had on hand when they began producing the note. Now, 3M has a trademark on this color. To this day 3M produces 50 billion Post-it Notes each year. They have a wide range of products, the newest being Extreme Post-it® notes that are said to hold up on any surface under any condition. This is another great example of an accidental invention. Suiter Swantz IP is a full-service intellectual property law firm, based in Omaha, NE, serving all of Nebraska, Iowa, and South Dakota. If you have any intellectual property questions or need assistance with any patent, trademark, or copyright matters would like to speak with one of our patent attorneys please contact us.